Oral cancer kills one person every hour in the U.S., and this doesn't come close to the number who are physically debilitated. Although tobacco and alcohol are the largest risk factors, this occurs often in those with no risk factors at all. You can't afford not to be checked. Oral cancer is one of the most curable diseases when it's caught early. 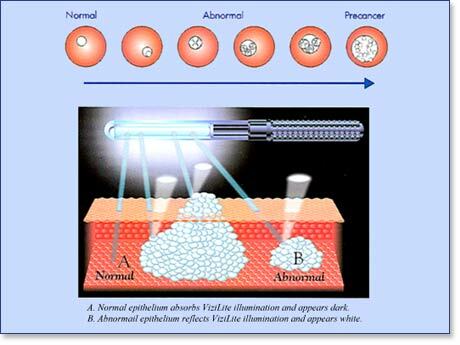 Dr. Maher Barsoum perform a visual oral cancer screening included in all dental examinations. He uses the Vizilite test if a guest has a family history of cancer or if he finds any suspicious tissue in the mouth. The ViziLite Plus exam will help Dr. Maher Barsoum identify abnormal tissue, that might develop into oral cancer. As with most serious diseases, early detection is the key to successful outcomes. Unfortunately, the problem with oral cancer is that approximately 70% of the time it is not visible to the dental professional until it has reached an advanced stage. ViziLite Plus technology will assist Dr. Barsoum in seeing abnormal tissue in the mouth, before it is plainly obvious. ViziLite Plus is a technology used by your Dr. Maher Barsoum to assist in the early detection of abnormal tissue in your mouth. ViziLite Plus helps Dr. Barsoum see abnormal tissue that is not visible during a regular exam. If you have any questions about Oral Cancer screening, please contact Dr. Maher Barsoum in his Chino or Upland office or make and appointment on-line!